In the last home game of the 2018 football season, Mississippi State honored its Seniors and all Veterans in a 52-6 rout of Arkansas. In the Senior Day victory, the Bulldogs wore special “Statesman” uniforms to honor the late G.V. “Sonny” Montgomery. 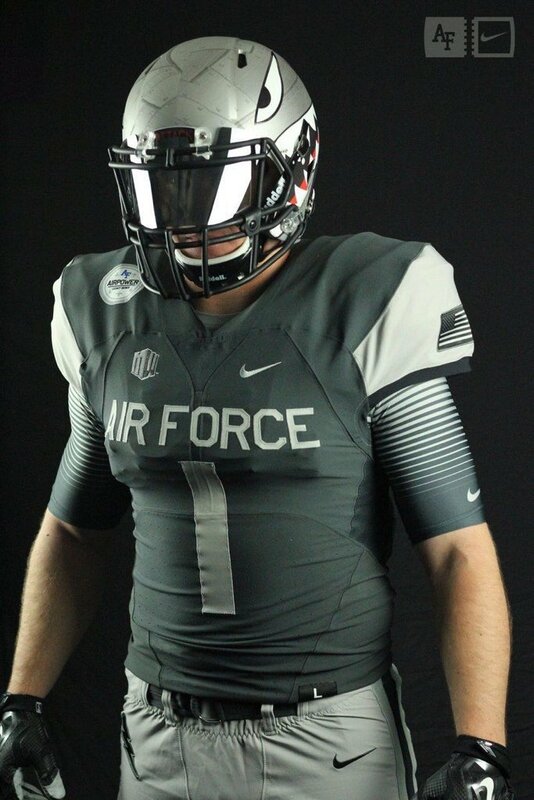 The uniforms are inspired by the Mississippi Air National Guard C-17 Globemaster III plane named "The Spirit of G.V. 'Sonny' Montgomery”; the plane actually flew over the stadium prior to kickoff, which was a really cool moment. 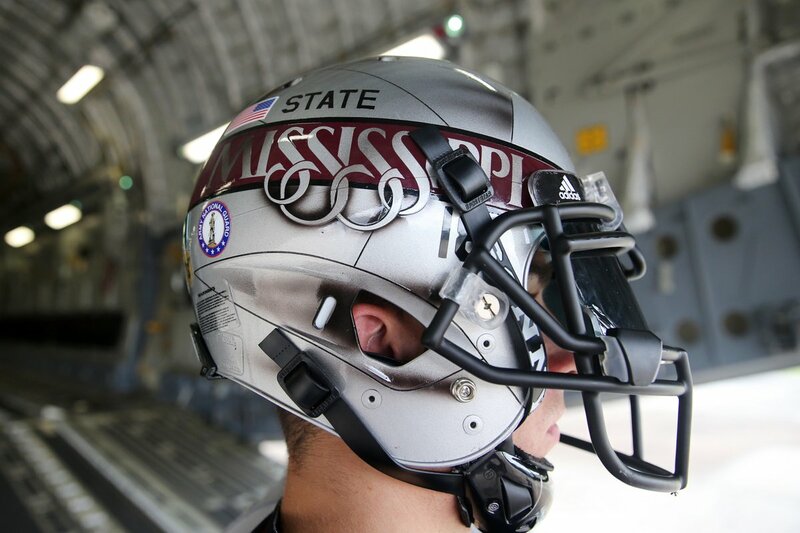 This marks the third consecutive season in which Mississippi State has worn one-off military appreciation uniforms; all three have featured silver helmets and monochromatic uniforms. In 2016, the Bulldogs wore all black uniforms with white numbers, a silver flag design on the shoulders, and an oversized M-State logo on the pants. Even though they were worn in an upset win over then-#4 Texas A&M, I still maintain that those were the worst football uniforms Mississippi State has ever worn. In 2017, the military appreciation uniforms took a step forward, this time featuring an all-maroon uniform with the flag graphics constrained to the inside of the numbers and sleeve stripes. The result was that the numbers and stripes looked silver from a distance, matching the silver helmets and creating a pretty solid alternate look. This season, the “Military alternate” idea was finally perfected. The helmets, while still having the same silver base color as the past two seasons, featured a really cool hand-painted design modeled after the tail design of “Spirit of G.V. 'Sonny' Montgomery“ plane. The helmets featured a horizontal black-maroon-black stripe that matched the sleeve stripe design; a “Mississippi” script sat on top of the stripe on both sides. Above the stripe sat “STATE” and an American flag, mimicking the “ANG” and flag as seen here. 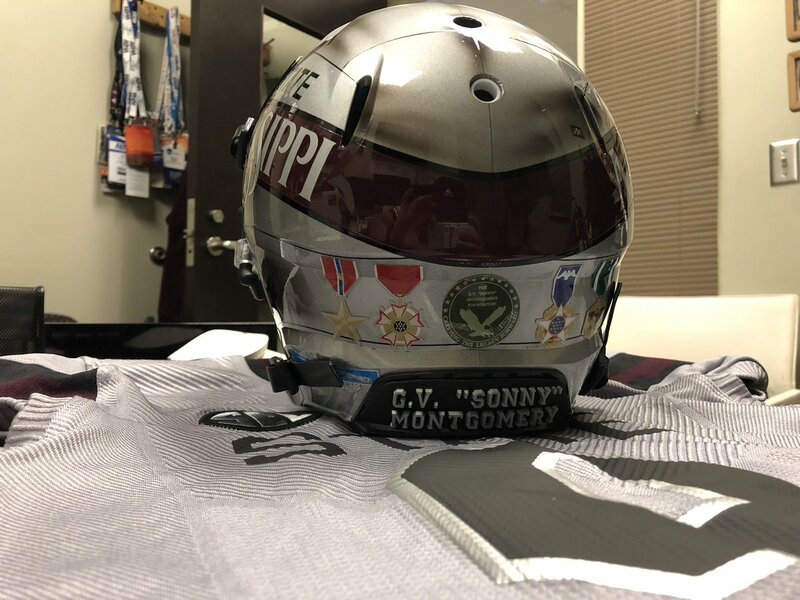 To complete the look, the back of the helmet featured all of Montgomery’s service medals. The rest of the uniforms also had a military feel. The jerseys were the first gray tops in program history, as well as the first to ever have “STATE” on the chest. Pretty much every other sport on campus has worn both gray jerseys and jerseys with “STATE” on the chest at some point, so it was interesting to see football finally join in on the action. Both the “STATE” wordmark and numbers were black and in a font similar to one Air Force has used in the past. The jersey sleeves featured black-maroon-black stripes that matched the helmets and kept some consistency with the rest of the Bulldogs’ uniforms, something that the previous military alternates lacked. The pants were the same gray color as the jerseys; they featured “Mississippi State” down the left leg and the “Spirit of G.V. 'Sonny' Montgomery“ logo on the right hip. Arkansas countered with white helmets, red jerseys, and white pants. Given how light State’s gray uniforms were, it made sense for Arkansas to go with their “home” red uniforms. I liked that they went with their white helmets and pants for the game; it allowed them to wear a good bit of white and still look like an “away” team so to speak, similar to how State did at LSU earlier this season. I really like that Chad Morris brought back Arkansas’s white helmets this season; obviously red helmets should always be their primary, but the white helmets provide a good alternate look for the Hogs much like State’s white helmets do. Especially after the slight updates they made this past offseason, Arkansas’s uniforms are really clean and some of the best “non-classic” uniforms in the SEC, in the same tier as Mississippi State, South Carolina, and Texas A&M, IMO. The Arkansas vs Mississippi State matchup, in which State has won 6 of the last 7 games, is no stranger to alternate uniforms. Mississippi State wore all-white as an alternate look in 2001 and 2017 (and as their primary look in 2005 and 2007); Arkansas wore all-white in Starkville in 2014 and of course wore white helmets this year. 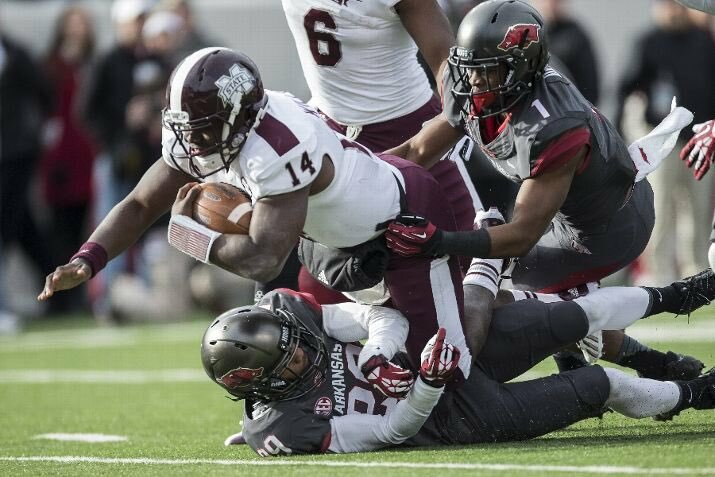 In 2013, Arkansas wore all-anthracite against the Bulldogs; in 2016, State wore their alternate silver jerseys with maroon jerseys and gray pants. 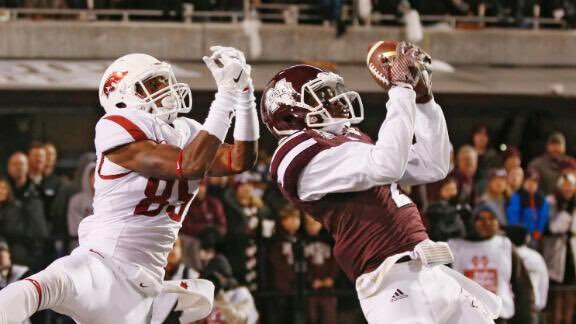 My favorite MSU vs Arkansas uniform matchup of all time is still 2015, when Arkansas went Red-Red-White and State went Matte-White-Gray in what ended up being a 51-50 win for the Bulldogs. With the win today, State improved to 4-3 all-time in silver helmets and 8-6 in gray pants since 2012. State’s record in alternate uniforms varies based on what you count as an “alternate”; sticking to specially designed “one-off” uniforms, this brings State’s record in them to 5-4 all-time. The previous five wins are in the 2011 and 2013 Egg Bowl uniforms, 2016 UMass “Patriots” uniforms, and 2016 Military Appreciation uniforms; the four losses are the 2012 and 2014 Egg Bowl uniforms, 2012 “Snow Bowl” uniforms, and the 2017 Military Appreciation uniforms. When you consider the other “alternate” looks such as the other black jerseys, 2014 DWS 100 uniforms, and 2013 Gator Bowl combo, that record becomes 14-8. The uniform model for this game is Senior QB #7 Nick Fitzgerald. In his last game at Davis Wade Stadium, the SEC’s all-time QB leader in rushing yards completed 9/14 passes for 127 yards and 4 touchdowns in addition to rushing for 85 yards and a touchdown on 14 carries. This Thursday is the game everybody in the state of Mississippi has been looking forward to all year: the Egg Bowl. After Ole Miss’ upset win in Starkville last year, Mississippi State is looking to get revenge on its struggling neighbors from up north. Will State try and emulate the 55-20 experience from 2016 and wear all-white for the third time this season, or will they wear a different combo in Oxford this time? We’ll find out soon enough.